The TWU doesn’t want its workers sacrificed to pay for the excess pay, low productivity, and outright corruption on the LIRR. So who should pay for it? LIRR corruption was one point this article failed to highlight. To wit, the many LIRR employees who were found to be fraudulently taking disability. They were doing so under a federal disability grant rather than money generated by fares or owed by the MTA, but yes, the LIRR unions are uniformly bad for the labor movement and bad for New Yorkers. Bad is bad across the board. Public workers and private workers paid from public contracts are out of solidarity with other workers, and more like Wall Street. Which is why data on where the money is going is getting scarce. There was a long article on LIRR Today (which is currently down) about timecard fraud by maintenance workers on the LIRR: charging for hours when they weren’t working and weren’t on the property. The utterly corrupt LIRR unions have repeatedly fought to avoid having time clocks. Probably so that they can keep committing such frauds. Federal dollars are not free money, no matter how large a majority in NYC treat them as such. It’s clear that federal spending is a hobbyhorse for you, but the idea that New Yorkers, as opposed to people elsewhere in the U.S. have a different relationship to federal expenditures is bizarre as it is counterfactual. I’m sick of all of these euphemisms. It’s not counterfactual — it’s just wrong. Spendmore is wrong. That’s all there is to it. He is right that if federal spending goes up we pay for it in federal taxes, and whether or not that’s a good deal vs. state and local taxes depends. More to the point, I doubt sincerely that the level of disability fraud we have seen at the LIRR — with the unions and management both involved and most workers who were not legitimately disabled doing it — only reflected worker attitudes on the day they retired. That same attitude toward the rest of us likely affected the way they worked from their first day on the job to their last, and still does so today. I’m sick of the euphemisms too. He’s not wrong, he’s delusional. What he said is so semantically muddled that it could have multiple layers of meaning. Since he scurried away and left it sitting there like a turd on the floor instead of explaining what he actually meant, everyone is now reading his own meaning into it. Well, I don’t have software that monitors the board, so I don’t know when someone responds. It seems some here either do not comprehend the idea that money from a distant source is not free money, or are so angry about that observation that they refuse to respond other than with derision. It has only one meaning, and it is simple. Regardless of how it was collected, those dollars represent time, effort, materials, and other resources. Simply because there was a distant agent (the Federal gov’t) mandating that some of that work be submitted to Rome the central government, the dollars don’t become free money. Now, in times of high unemployment, there is a bit of economic magic that can be worked by moving $$ around: the people not working, the land & materials not in use can be put back to work with “fictional” money to produce real goods. If those goods do something of economic value, they produce real returns, which will likely generate $$ reflecting that value. But that’s not the case here, these projects will not use many currently idle workers, machinery, land etc. TL:DR I said tax $$ ain’t free, it comes, ultimately, from somebody showing up to work x millions of somebodies. Wasting tax $$ is taking a piece of people’s work from them and burning it. First, your crude analysis entirely omits several points, most importantly, the benefits that come from improved infrastructure. Second, your condescending suggests that taxpayers, who are sending money to Washington, don’t have a right to demand that that money be returned to their communities. New York State taxpayers have been a net contributor to the federal government for decades, and justifiably want some of their tax dollars to be spend in this city to improve their lives. Lastly, you don’t need “software” to monitor this thread, just check the radio button below your comment. Why wait for a response to relate what you say back to the topic at hand? Neither JEG nor Ben spoke approvingly of disability fraud. Ben simply stated it wasn’t strictly a problem with state government policy. And your naivete about monetary policy aside, Gordon Gekko was wrong. Money is created and destroyed every day, around the clock, through processes like fractional reserve banking, debt monetization, and normal destruction of cash in the M1 money supply. No matter how it’s created it’s equally “real,” caused to be brought into being by deliberate choices people make. Plus, WTF does the LIRR disability fraud have to do with the views of “a [large] majority in NYC”? Why are you blaming people in NYC for the behavior of people who presumably mostly live in the suburbs? No, Larry, when it comes to federal money he’s wrong, and you’re wrong too. It IS free money. Really, literally, free money. Federal spending is completely decoupled from federal taxes. The federal government *prints money*. You may have heard of the Bureau of Engraving and Printing? That’s where federal money comes from. It is, in actual fact, free. The federal government NEVER has to “raise taxes” to pay for it. They just print it. Reagan figured this out, and followed a “spend more money, cut taxes” policy — Reaganomics. Now, there is one problem with pursuing this policy indefinitely: inflation. But inflation is the only real restriction on the federal government’s ability to print money and spend it. The LIRR unions remain completely corrupt (see above about timecard fraud among the maintenance workers) and I really don’t think these scam artists should be given free money, when we could use the free money for something useful instead. It is exceedingly depressing to see a union deal encompass all of the anti-union rhetoric of rent seeking, productivity-defeating behavior. Even ignoring the holistic damage to the transit system, it harms the larger progressive movement. Every other freaking city in the country has managed to get OPTO in their union agreements. What’s wrong with the unions in NY? Unions should NOT be allowed to hold up progress when it comes to public transit, it’s crazy. LIRR bottlenecks should be fixed. Reverse peak service should be added. They should run more frequent smaller trains (possibly automated). They should use proof of payment instead of the current excessive ticket checkers. LOL @ automation on the LIRR. They will fight that tooth and nail. Start hiring minorities for those gold-plated jobs on the LIRR. Within a decade all the featherbedding and excess cost will not seem like such a good thing after all, and an effort will be made to force people to actually do their jobs. That’s how the subway turned around. Huh? How’s that working out at WMATA? Take the train during off hours/overnight here in NYC, where you can see a work crew on the opposite track. Lots of standing around, and that’s where the public can see. There must be 5x as much when it’s not visible. …the TWU has trumpeted the new agreement featuring “No Concessions!” That means no work-rule reform, no reduction in staff and, on the MTA’s side of the ledger, no labor cost reform. No attention to transit at all, in fact. Why not some kind of third way? If we are keeping these employees, the TWU can’t really name it a concession if their jobs change to something more useful. We don’t need many token booth clerks, but we do need everything from cleaners to various kinds of maintenance people to bus drivers. There’s plenty of work not being done. And it’s really for the MTA or the state to propose that, not the TWU. The only way public employees can continue to get richer and richer relative to other workers, as has been the case including benefits, without making other workers worse off is if their productivity improves faster. Which ought to be possible since they are starting from a lower base. 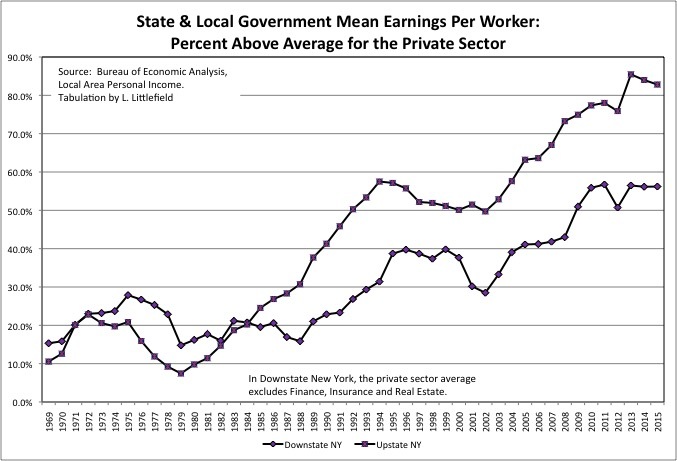 I examined NYCT productivity over the decades with a simple measure, and it is good in some cases and not good in others. Forget about it on the LIRR. To the wealthy who control American businesses the question in response to the crisis of demand is this: you won and collected up all the money. Now who are you going to sell to? To the public employee unions the question is this: you used political power to inflate your compensation and the power of choice when you go shopping to reduce everyone else’s. Now how can they afford you? As far as it goes I’m sure you’re right, but I’m not sure productivity is a very useful measure here. No matter how many “units” of customer service a token booth operator produces, or how many announcements or door openings a conductor performs, s/he is not producing anything that cannot be provided some other way. No matter how skilled or dedicated they are, the former probably have horrible productivity because most are unlikely to need to do much during the day. The latter, on the other hand, probably have quite high productivity. Dead wrong, because you don’t understand how money works. Hint: they print the stuff. While I completely agree with what you said above I would like to add that one of the reasons the MTA won’t say anything about this deal is because the TWU members have yet to accept it. The MTA is non incompetent, they may have given 2.5% increase vs the original 2% but they got it back in other ways, namely health coverage and choice. One TWU member actually brought this up yesterday at the board meeting. If you notice all the media information on this deal has come primarily from the TWU not the MTA, the TWU is trying to pull the wool over its members by saying things like “no concessions” etc. The TWU obviously would not publish any mention of work rule reform even there was some. Furthermore, TWU management stands to benefit from higher wages through its levy of union dues, where as in new benefits such as health etc it cannot levy hence them not caring as much. What also matters is how the average income of those paying for the TWU deal fares in the next two years. If other people’s incomes (and inflation) go up faster than the cost of TWU wages and benefits, then the TWU contract gets more affordable. But the trend has been the reverse. I wish the MTA management had a bit more political will to reform some of the work rules. I have no issue paying employees more, but that comes with the expectation of more productivity / commonsense work rules. SMRT Corporation is a good example of this with its highly paid civil servants both on track and in the office allowing it to achieve high operational performance. I think the most glaring the MTA should first change is fully staffing a train that drives itself. The MTA could start out with OPTO on ATO train lines only (eg. L and soon the 7) which would be an easy compromise for management and labor. Plus not only will it have cost savings from less employee hours working, but it will also allow the MTA to reduce the oversupply of workers its contractually obligated to have to full fill union staffing requirements. Maybe that will change under the new CEO but we will see, Cuomo unfortunately seems to want someone who knows construction which is asinine considering how much praise the outgoing chairman is getting for actually understanding the nuts and bolts of the MTA’s operations. 1. You show up, you work. Management figures out where to best assign you that day, preferably the job corresponding to your title, but possibly anything that needs to be done. 2. Management is responsible for making sure your job doesn’t kill you, remove parts or figuratively beat you to death. They’re also responsible for promoting morale by not allowing supervisors to play favorites and send you to the nastiest task because the boss doesn’t like your face, and otherwise seeing that you are managed properly. … though give the reality of any bureaucracy, some further limits may have to be placed on management. Perhaps broad categories of work, rather than rigid, specific tasks can be assigned. Historically, most unions were formed because of violations of (2). And also when management was not paying enough to live on, so that the workers were starving. Nobody will lose their job, and nobody will have a wage cut. * Positions will be eliminated as people retire. * Anyone from a “disappearing” position who wants a transfer to a different line of work (driver -> customer service agent) will be preferentially given that job, rather than putting it out to open bid. This is a humane way to go about things. It means that the transition is slow, but *it still happens*, because they never hire any *new* people for unnecessary jobs. Oh, god, health coverage is still messing up employment contracts? We need single-payer healthcare, like, ten years ago. Every other developed country in the world has single-payer healthcare, and now so does MEXICO. Health insurance shouldn’t be in employment contracts at all. Perhaps the negotiations would be saner if we had single payer. Let’s face it retail banking and consumer insurance products are rather staid products that don’t require wizards of finance to manage. But if we replaced all those wizards of healthcare and banking with stodgy old civil servant like people who could do a perfectly fine job of it there wouldn’t be any wizards of healthcare or banking with fat checkbooks waiting to be emptied at rubber chicken dinners.